Here it is! Week 01 has been 6 months in the making so Week 02 may be a while to wait (and at the current rate of production the whole battle will take over 7 years to complete) so enjoy! 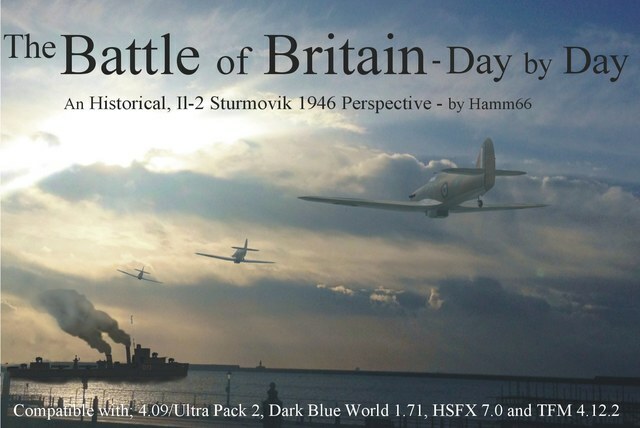 Included in the download are versions tested for Il2 4.09/UP2, Dark Blue World 1.71, TFM 4.12 and HSFX. Each is in its own folder so just drop the contents of the 'Missions' folder from the version you want into your root (game) folder in your game and everything should go where it should. In GB you will find a folder called 'Battle of Britain...' and in DE you will find a folder called 'Luftschlacht um England...', these folders contain all the missions filed by date, time and flight, so they appear in game in your Single Missions section under RAF - Battle of Britain... and Luftwaffe - Luftschlacht um England... (or the equivalent in your modded version). These missions are made in DBW (tested in 4.09/UP2) and TFM 4.12 (modified and tested in/for HSFX), they may work in other modded setups but use at your own risk. Just overwrite the missions in your CUP/Missions/Single/GB/Battle of Britain - Week 01 folder and CUP/Missions/Single/DE/Luftschlacht um England - Woche 01 folder and they should work. Oh and I added the Bv 141 to my install of CUP for these updates and it worked fine on my setup. Well having read your post at M4T I'm looking forward to this and others (hopefully) of this campaign, what a lot of work . Please remember that I am age-challenged (72 this past month) - each of the missions tried starts with the Spitfire on his nose into the dirt . I am trying it in the new TFM-412 and I used the correct one from the download as far as I can tell. Any suggestions? What have I done wrong this time? Thanks for any help. So you have a working TFM 412 and I seem to recall you got most of Monty's BoB missions to work. I take it you can taxi a Spitfire around in the Quick Mission Builder? So which mission for starters, day-time-squadron number, and does the spitfire nose over or does it start actually on its nose? It might be an extra mod so if you can tell me what you have activated besides the numbered packs in jsgme I can compare to what I built it in. Edit: A couple more questions. When you open the mission in Single is there a mission description/ breif, historical note? If not you have the wrong version with installed. In QMB try the Spitfire Mk Ia, just a single plane, no enemies, in a Scramble mission in a map like Normandie. Does it start normal here and can you taxi? Yep, I get the briefing screen and all. The mission seems to load, Spitfire inside cockpit "materializes", then a thud, and I am sitting flat in the mud with my prop spinning but not going any place. The external view of the aircraft look funny. The wings up by the wing root have some sort of indentation which is peculiar. And the other Spits around me on the runway are on their noses. I have all the TFM mods enabled (through like Heavies), and the BOB missions work. I have Mission Pro Combo, Menus, HD skins, Radio 01 and 02, True Color Textures for SAS Modact, and RWD8 enabled through JSGME. I have not idea what the RWD8 thing is, or if a need the HD skins or true color textures but I guess I must have enabled them at some point. The first mission of your download is the one I have had trouble with initially. But I did try and load a couple after that (don't remember which ones exactly) and the same result. I will try the QMB thing you recommend, and get back to you. Thank you again for putting up with me, and for the help and patience. I think I have found the problem! I set the difficulty to 'Easy' and - Bang -I was a wreck just like you describe. Try changing some of the difficulty settings around - I would suggest start with full real and then back off until you can take off and fly. Edit: I'm on my phone now as I am off to work so I cant test this. Specifically in the Difficulty settings there is a switch that turns off Takeoff and Landing. If you try starting in the air with these missions (except the ones that say 'air start' in the brief) you will crash on the second waypoint as they are taxi waypoints at zero altitude. I think this is the cause but I wont be able to test it until tonight. Thank you again. Firstly, I went in and changed the mods I had enabled to the ones you showed. Next, I just started playing around with the missions (as much as I am able to), and I found something really remarkable. I got the first, seventh, and tenth missions to work, but man, is it amazing how I went about it. Started mission, got past the brief screen(s), loaded OK, then, mission started and I ended up flat and in the dirt as in the past. Well, I tried my autopilot key and like magic my aircraft raised up onto its landing gear and it was good to go. Most amazing thing I ever saw. One of the ones I tried which had an air start did fine. But now I need to try your fixes concerning difficulty settings. I'll be letting you know. Thank you. Hamm66, you are one smart dude The difficulty settings you told me about did it. I have tried the first two missions and they work as they are supposed to I think. You are like me I guess. I had most all my settings set to easy with few exceptions. My eyes and nerves are to the point now (after that new damn cancer medicine they now have me on) where I just have a hard time sticking with much of anything that requires concentration. But that's my sad story......Anyhow, thank you very much for your time and for your help. Glad you got it working Bob! Thanks again for all your help. Now that I think about it - you mentioned Monty's BoB campaign. I did have a bit of trouble with a few of the missions so maybe it was the difficulty settings in it also. I'm gonna see. Enjoying your missions, now. Thank you. Please could you upload this to somewhere other than Mission4Today. Mission4Today is down so no-one can get at these missions. Would love to give these missions a go as there does seem to be a lack of RAF BoB/English Channel/ETO content, even after all these years. Thanks man, much appreciated. BTW what's CFM?